This Zoe Chicco hand chain refines boho chic with 14-karat yellow gold and dainty, decadent diamonds. 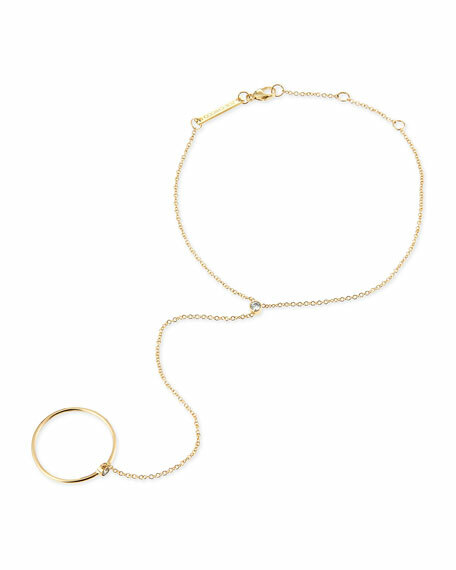 Zoe Chicco one-finger hand chain in 14-karat yellow gold. Cable chain bracelet wraps around the wrist, connects to one ring. Round-cut white diamonds, 0.10 total diamond carat weight. Adjustable from 6", to 6.5", or 7" long. Ring sizes offered in 3-8.5 (half and quarter sizes available). Lobster clasp with small Zoe Chicco logo charm.